Being seen for the first time at PLASA on Stand J50 is Doughty Engineering’s innovative motorised lectern, as well as its new and stronger range of truss adaptors. 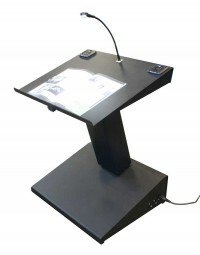 The unique lectern – the first of its kind – is fully DDA compliant and visitors to the stand will be able to try it out for size. Designed and manufactured in the UK, the black powder coated steel lectern is supplied with a reading light and fitted with anti-vibration/ noise dampening microphone mounds to ensure a clear, concise sound from the user. Riggers are being enticed to the stand by a brand new range of truss adaptors, designed with the theatre and outdoor events in mind. Made from solid highly tensile aluminium, they fit all major brands of triangular and square truss, enabling it to be lifted into place safely and securely. With a choice of three hanging sizes – 250kg, 500kg and 1000kg – the new truss adaptors are fitted with slim line clamps. The 250kg size comes as either a fixed or swivel version and is available ready fitted with a 28mm Euro spec spigot. As always, customers can discuss their specific needs with a member of the Doughty team whether they require an off the shelf or bespoke solution.